When there’s no answer that comes from her mouth, and only several unsatisfying, “I’m sorry’s,” you turn to your husband to explain. When he only answers by squeezing your hand tighter and with silent tears that stream down his cheeks, you keep asking, over and over. 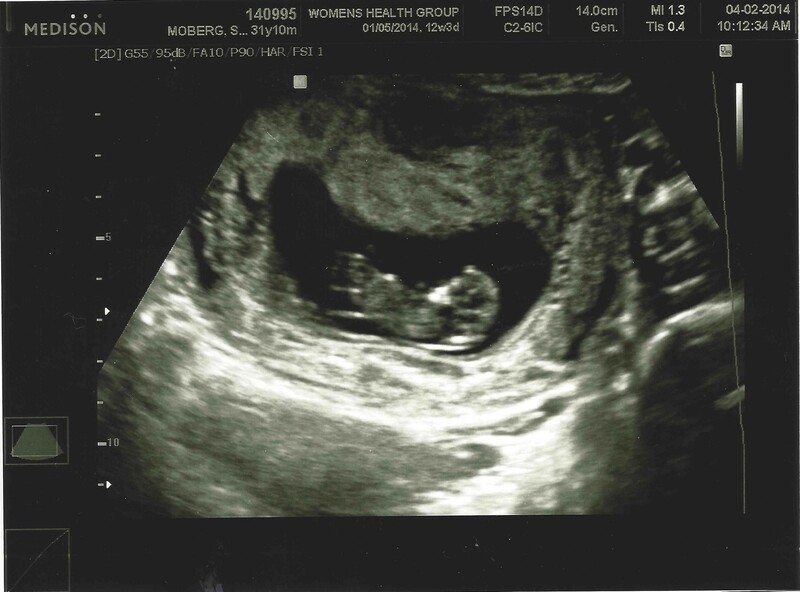 You get off the table when the ultra sound tech leaves you alone and you curl up on his lap and cry hysterically, still asking the same question and shouting, “no, no, no” to no one in particular…but deep down you know you’re talking to God. You are moved to the doctor’s room and you wait together, crying and in disbelief. You ask a hundred questions that you’ve had to come up with on the spot. You hold your husband’s hand and close your eyes over and over again, hoping that if you blink hard enough you’ll wake up from this reality that feels far too unreal to be real. And then suddenly, you are grateful. You have never taken your children for granted, you have always known they were miracles, but suddenly, right then, you are more grateful to God than ever before for the two lives he has already given to you to raise and love on this earth. Your husband says, “let’s go get our kids and hug them tight,” and you know he is thinking the same thing. You somehow drive home, in separate cars, and walk into your familiar, messy house. Everything is the same, just how you left it, yet everything is so different. You sit on the couch and tell your 3 year old that we are not going to get to meet the baby in your tummy as we had planned. We will not get to hold the baby or see the baby, the baby will not get to sit in the extra high chair like he talks about every night at dinner. You tell him we will meet the baby in heaven, and when he asks when we get to go there you don’t know what to say. He asks a few more questions, that you mostly don’t know how to answer, and then he jumps up and proclaims that he wants to play. You are sad that he doesn’t get it, and so grateful that he doesn’t have to. You put the kids down for naps. You lay in bed with your husband and cry so hard together that you soon can’t discern whose tears are whose. You wake up to the sounds of your two children laughing and playing hard with your husband, and you are so grateful hear the sounds of LIFE flooding your home. You fight your nausea and head downstairs to be with your family. Your husband hears you and runs to greet you at the bottom of the stairs with red eyes and a kiss. You cry a little more in his embrace. Your children run to you, and you cling to them with tears streaming down your face. You play with them, gratefully. You jump and down and shout hooray when your 3 year old puts his poops in the potty. And then you turn around and laughter spills from your heart when your daughter puts her big brother’s underwear on her head–again–like a hat. You grieve and grieve and grieve. You cry with your husband. You cry with your best friends. You pick yourself up, get the kids dressed, and go eat sushi. You delight in your son using chopsticks for the first time. You go to the park. You cry on the way. You get home, get the kids in bed, and cry with your husband some more. You thank God, for the hundredth time that day, that you married a man who values LIFE, and who fights for life. And then you thank Him again. You take a pill and try to sleep. You see that your husband is not next to you, and then you hear him…downstairs, in the middle of the night, crying and crying out to God for a miracle. You wake up after fitful sleep and see that it’s morning. Your heart aches, and then you remember why. You see that your husband is still not next to you. You pray. And pray and pray. You call out to your husband. He comes running in the room, with red, red, wet eyes, and proclaims scripture after scripture to you, declaring God’s goodness, declaring hope…all through a broken, broken heart. You cry, and thank God again for your husband. You thank God for his weakness in this moment, and also his strength. You go back to the doctor for another ultra sound…just to see…just to see if God had performed a miracle. You see instantly that the miracle was not the kind you had hoped for. But you get to see your baby on that screen again, and you love your baby, somehow, even more than the day before and the day before that. You remember that your littlest is in the arms of the One who formed him or her…understanding and experiencing His love more than you ever have. And you are grateful. And sad. And grateful. And so, so sad. You realize this is all far, far too much for you to understand. And so you look up. You are surrounded in darkness, so you look up. And you see Light. You look up through your tears, you look up through your grief. And when you look up, and see Him, your grief is comforted. Not less, but comforted. When you look up, and you know…you KNOW…that this sweet little one will never know pain, will never experience hurt, will never taste sorrow…when you look up and you know THAT…then you can breathe again. Because your littlest is in the arms of the Lord. The arms of the Lord. You wish with everything in you that your baby was still with you. But when you look up, you are okay. Because the alternative is so rich…you know the alternative is Glory Himself. In the arms of the Lord. You wonder how you will put one foot in front of the other. Walk out of the room. Love your family well. you meditate on Him in the night watches. Therefore in the shadow of His wings, you rejoice. How quickly you forgot. But at least you remembered…as soon as you looked up. Yes, you are in shadow, but you are in the shadow of His wings. Somehow, in His strength, you rejoice. Rejoice that One died so that we ought never need taste the pain of death. You know there has been no eternal death here…no, your baby is with the Lord. Your baby has passed into LIFE…life with Life Himself. You know there is no eternal death. Only eternal life. You believe that His goodness cannot be overcome by darkness. You don’t know how in this moment, but YOU KNOW. and you will praise Him yet more and more. for you do not know their limits. You will make mention of His righteousness, of His only (Psalm 71). Though this feels very much like “the end,” you know it is just the beginning for your littlest one. And so, while nestled in the comfort of the shadow of His wings, you look up. Oh, sweet baby, you are up in heaven now, praising Him with all of your heart, mind and soul. Yet still, our heart will ache for you until the day we can hold you in our arms, alive. Goodbye, our most precious, precious baby…Goodbye for now. We are crying and rejoicing with you. Thinking about and praying for you, dear Moberg family. Thank You for sharing this, this is so powerful and beautiful. Praying for you both in this season, thank you for allowing us to be apart of this process….what an honor. Beautifully Written…Our Hearts are Aching With You Guys…. Beautifully written indeed. Thank you for your vulnerability again, Susanne. There is hope, amen! Crying with you, and rejoicing in the wonder of eternal life. May The Lord give you strength. Love you, Suz. I love you Susanne, and I have no words. I’m so so sad. I’ll be praying God continues to strengthen you and your Brian. < Our 3 Year Old Working Guy!